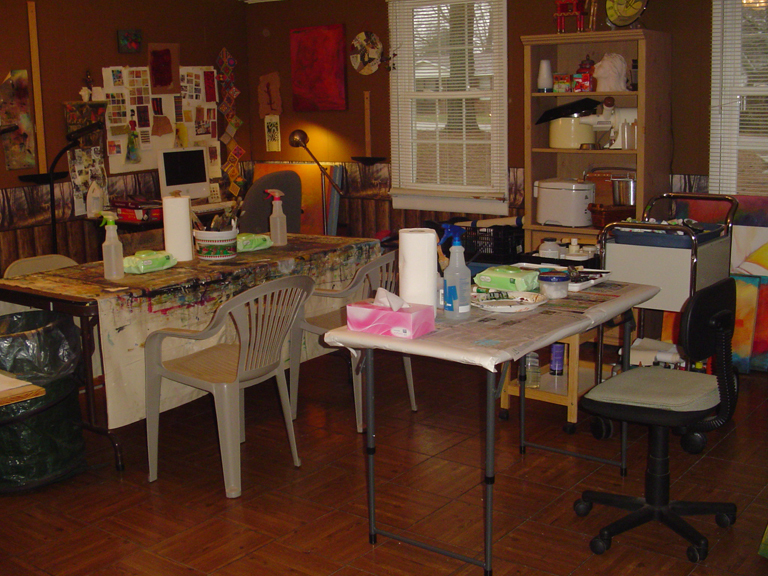 Tomorrow the weekly painting classes begin in my studio. It’s set up for four students, even though I would have taken as many as six. As it turns out, I may have only the original two people, and that’s fine too. After all, this is an experimental run at having classes. I’ll know a lot more about what direction to take after this. I do know that these two students are very interested in learning a lot about the “tools of the trade” — techniques for applying paint, textures, gels, mediums, and some mixed media effects. They will decide what they want to do with it on their own, and meanwhile we will play and play. So as promised, here are some pictures of the finished setup in the room. My demo table is in the foreground, with the larger table where the students can work. I have table top easels, but they aren’t going to be needed right now. They’re available any time someone would like one. 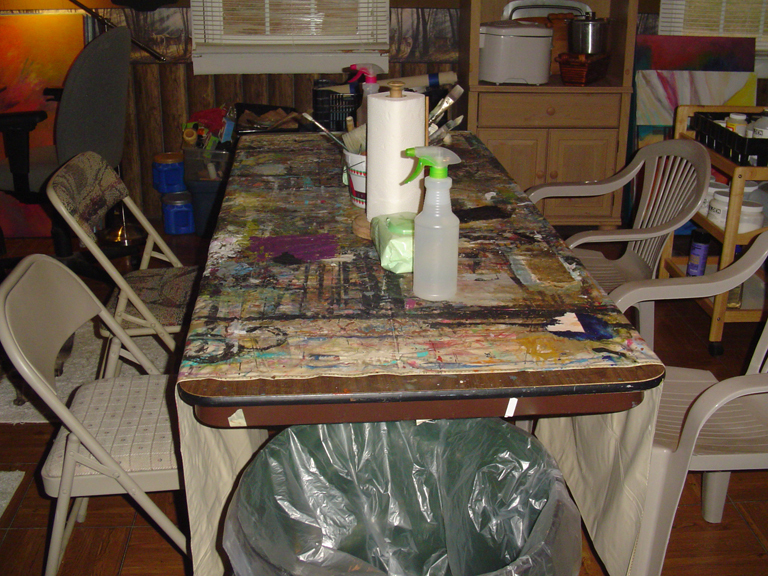 Yes, I’m using my same table cover, an old vinyl shower curtain that’s been in use for years, with its layers and layers of paint. I should add that the shower curtain was brand new when I started. It was never used for actual showers. And here’s just a tiny peek at how driven I can be. 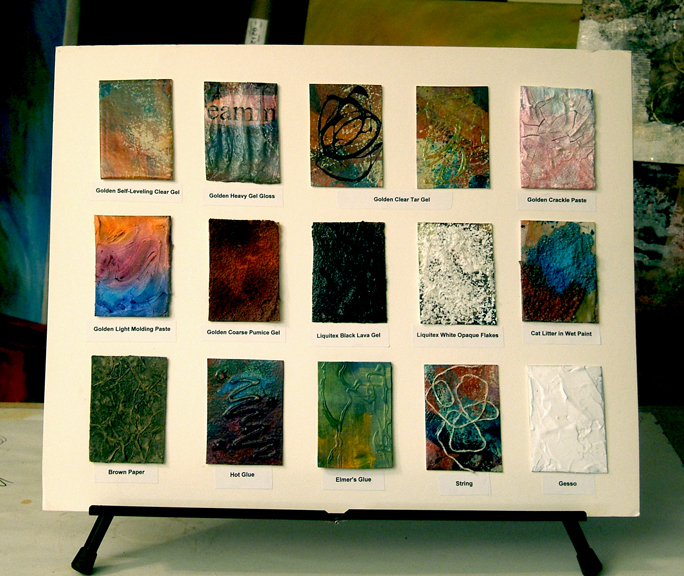 I’ve created texture samples to show some effects of the different gels and mediums, plus some homemade textures too. Of course I had to type and affix labels underneath each one! I’m looking forward to a fun series of classes. Would you Dare Tell All? I’m happy to report that Seth Apter at The Altered Page has featured me in Chapter 2 of Tell All yesterday, Sunday, January 13th. I didn’t reveal that much, but if you read through the many statements by all the participating artists, I think you’ll relate to much of it. It’s nice to see we’re not alone as artists! Thanks so much, Seth! I am so jealous I am not one of your students. Your studio looks artist ready. Hoping to some day have online classes, Angelpainter! I’ll let you know. Thanks! Martha – I really like the manner in which you have set up your chart. And, I know your students will learn so much from you in not only techniques, etc but “being an artist” ….as well ….. Thanks Shirley — I hope so. I know I can teach them a lot of the techniques, plus spark ideas for even more that haven’t been invented. The “being an artist” part comes at the spaces in between. That texture sample board is incredible. What a great learning tool. Thanks for spreading the word about Tell All! You are so welcome, Seth! Glad you like the sample board. And now I have enough ideas for a whole additional one. That first set of 15 samples is just a start. It looks fab; I wish I could come and play/learn. Love your samples and the shower curtain is a stroke of brilliance! Thanks, Cath! Like my shower curtain? I’m sort of attached now too. I so wish you could be here. Thanks, Itaya! I will update you on the fun times, because above all I want it to be fun. Glad you like the sample board. Your studio looks great. We like the fact that you even take your time to create the textura sample, just one question ¿are your classes for adults, teenagers or children? Thanks art4kidsandteens. This particular series of classes is for adults, but I have taught all ages.